(Beware of a Holy Whore)Der amerikanische Soldat (The American Soldier)Niklashauser Fart (The Niklashausen Journey)WhityDas Kaffeehaus (The Coffeehouse)Rio das MortesWarum läuft Herr R. Amok? Bolwieser (Kurt Raab), stationmaster in a little Bavarian town in the 1920s, feels that with his marriage to Hanni (Elisabeth Trissenaar), daughter of a brewery owner, he has achieved happiness and good social standing. But the entire city knows that Hanni turned to the tavern owner Merkl (Bernhard Helfrich) long ago. When Bolwieser hears about the rumor, Hanni and Merkl report the worst “slanderers.” He even commits perjury in order not to lose his wife. However, he is unable to live without the illusion of his idyllic marriage. 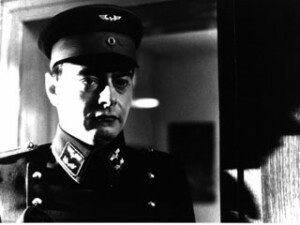 The human tragedy takes its course: Bolwieser begins to drink, his wife leaves him for the hairdresser (Udo Kier), and the stationmaster is even sentenced to jail because of perjury. Hanni files for divorce. Rainer Werner Fassbinder, after Oskar Maria Graf’s novel Die Ehe des Herrn Bolwieser. 16 mm, Color, Part 1: 104 min. ; Part 2: 96 min. ; theatrical version: blown up to 35 mm, 112 min.